A 700-metre-long stretch of a dual carriageway road lies abandoned in the town of ’s-Hertogenbosch. A long time ago this used to be the main route to Nijmegen (via Hintham). The asphalt is starting to crack but the lines and arrows on the surface have never been removed. The road hasn’t been used since 2001, at least not by motor traffic. The cycleway next to it was upgraded and its smooth red asphalt is used by many school children on their bicycles. What is the story here? This abandoned road has been left like this for 17 years. The road and the houses next to it were constructed immediately after World War II. The road had been opened in 1946. Immediately after World War II the city of ’s-Hertogenbosch built a new road to the east, to Nijmegen. The road was opened in 1946 and was a dual carriageway road at most places. It connected the town to the village of Hintham and from here it led to Rosmalen, Oss and further east. The main road was narrow in that village of Hintham. 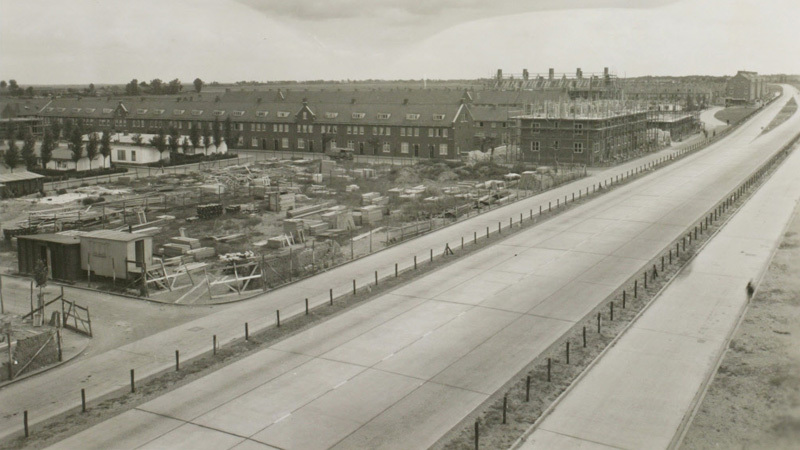 But in 1946 – before the construction of motorways – that was how main roads were designed and constructed. The motorways (freeways), that the Netherlands started to build later, went around towns and cities. But this road still connected directly to the village main street. It took until 2010 before the actual motorway from ’s-Hertogenbosch in the direction of Nijmegen was finished, but already in the 1990s the main flow of traffic was diverted from this road to the existing motorway (A2/A59) around ’s-Hertogenbosch. That made it possible to downgrade this former route and that is exactly what was done. A new bypass north of Hintham (that had become part of ’s-Hertogenbosch in 1996) was constructed around the turn of the century. The new road was never meant to carry the volumes of traffic that the old road had carried and it has therefore become “just” a 2-lane road; one traffic lane in each direction. Completely in line with the then new Sustainable Safety policies it was built away from where people live their lives. It has no other function than to get many vehicles from A to B fast. There is no parking, there are no end-destinations. The new road was opened in 2001, but how do you get people to use that new bypass, that is also 500 metres longer than the original road? The answer is simple: close the old route, at least partly. The 700-metre-long stretch of closed road then seemed forgotten. It was almost untouched ever since. The big trees lining that old road kept growing and have created a kind of eerie tunnel over the abandoned tarmac. There are still lines on the asphalt, some arrows to indicate turning lanes and there is even the word “BUS” at one location. Nobody really gets why nothing was ever done with this space. Especially the residents of the homes alongside the old road. Normally you would have a plan when you redesign something, for what to do with the old location, but in this case – even though the road is designated as “park” in the area’s current land use plan – nothing, absolutely nothing, was done in the first 14 years after this road was closed. The 1946 main route used to lead traffic here: the main street of the former village of Hintham. 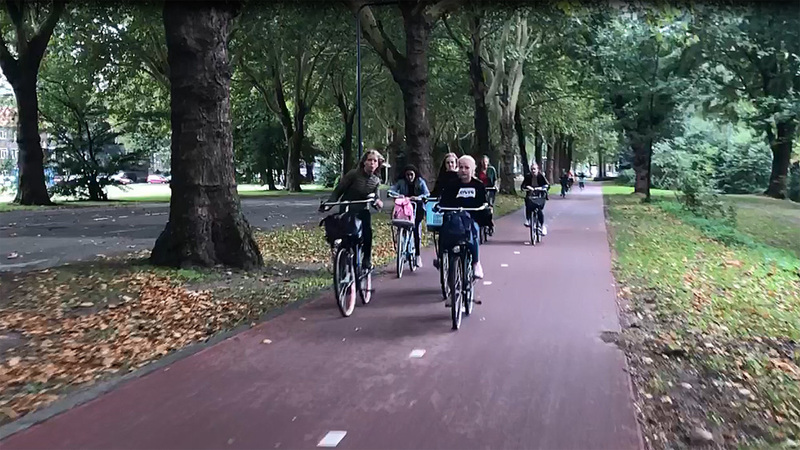 Under current Dutch Sustainable Safety policies this can no longer be a main route for motor traffic. The alternative route – that was opened in 2001 – leads motor traffic north of the former village of Hintham. There is now only one car lane in each direction. The cycleway next to this new route is part of the F59 Fast Cycle Route to Oss. Sometimes people publicly wonder why nothing happens. In 2008 some residents joined forces to get rid of the asphalt. After asking the council numerous times, to no avail, they took out a tiny bit of it themselves and replaced it with grass. That may have woken up some in the city council. An intersection, that lost one of its arms in 2001, was reconstructed as a roundabout. The beginning of the closed street – that had only had temporary fences until then – was taken out completely to better hide the fact that there even ever had been a street here. But that was only 100 metres. Beyond that the asphalt remained untouched. It would cost 300,000 euros to take all the asphalt out. Perhaps it is more difficult than at some other places, because it is a coat of asphalt on top of the former concrete road. In 2008, during the crisis, the council did not want to spend that amount of money. It did however find money to upgrade the former service road to become a main cycle route. 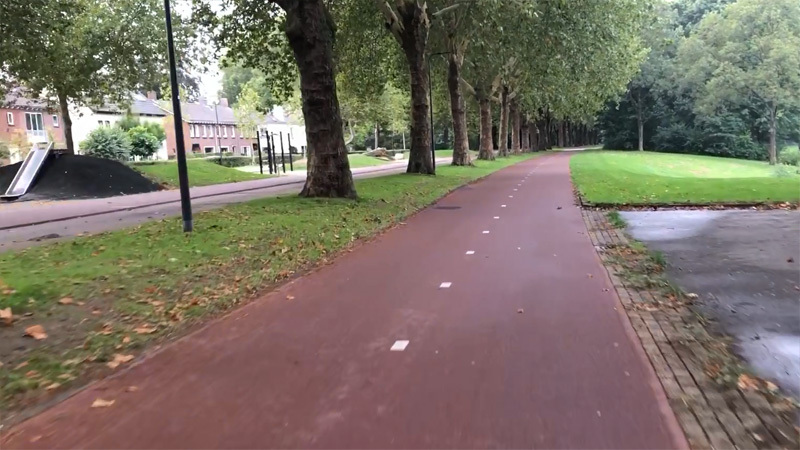 The brick surface of the service road was changed into the smooth red asphalt that we know so well for Dutch cycleways, in 2016*. 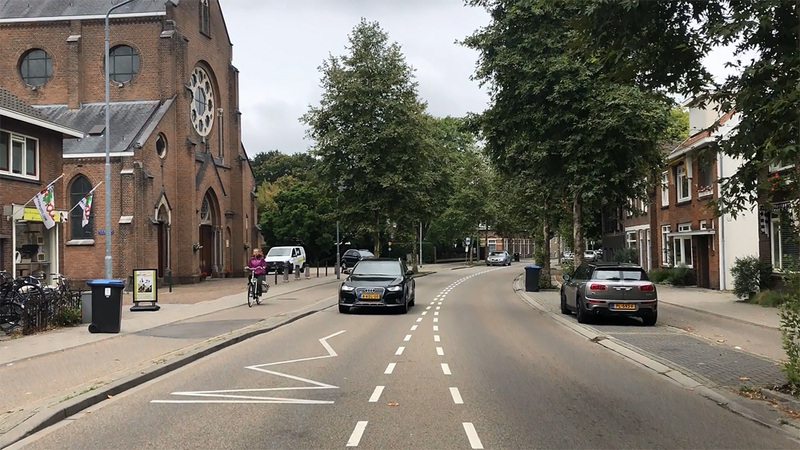 Next to the abandoned road there used to be a service street with a brick surface, that was used for cycling (still from a video I filmed in 2010). The exact same location today shows that the former service street is now a main cycle route with a smooth surface of red asphalt. The residents kept lobbying for more action. Waiting for that park that was promised. In 2013 the council finally found some money to build a playground. Instead of taking out the old asphalt some of it was now covered in an extra coat of red asphalt. A roller skate track encircles the old central reservation (median). On that old central reservation a swing, a tree to climb onto and a seesaw were placed. This playground was opened in 2014. But the design for the playground is different from what was actually built. The new roller skate track only covers one of the former two car lanes, not both like in the design. The roller skate track is also 50 metres shorter than planned. Again, the city seems to have been reluctant to spend money on the abandoned road. The main carriageway of the former route has now become a playground. The red asphalt on top of the old road is a 450-metre-long roller skate track. There is a swing, a seesaw and a play court, all in the former median. That this part used to have a bus lane becomes obvious from the original lettering on the surface that has never been removed. The 2013 design for the playground was a bit different. 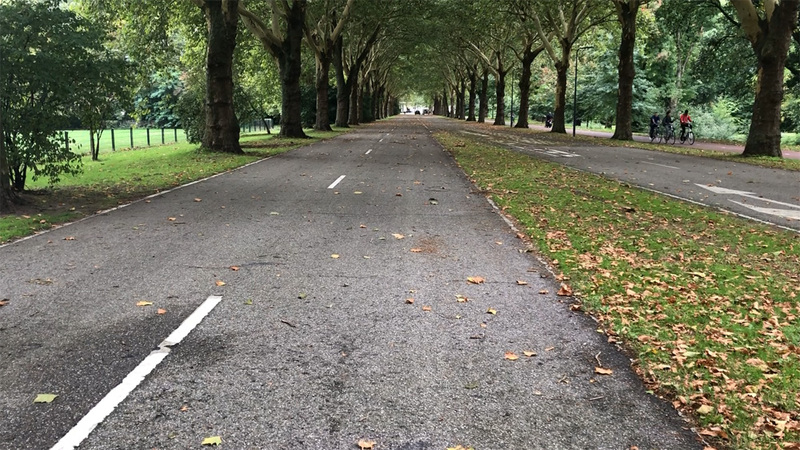 The entire former surface of the old road would have been transformed into a roller skate track that would have been 500 metres long. It seems some money was saved by changing this plan. 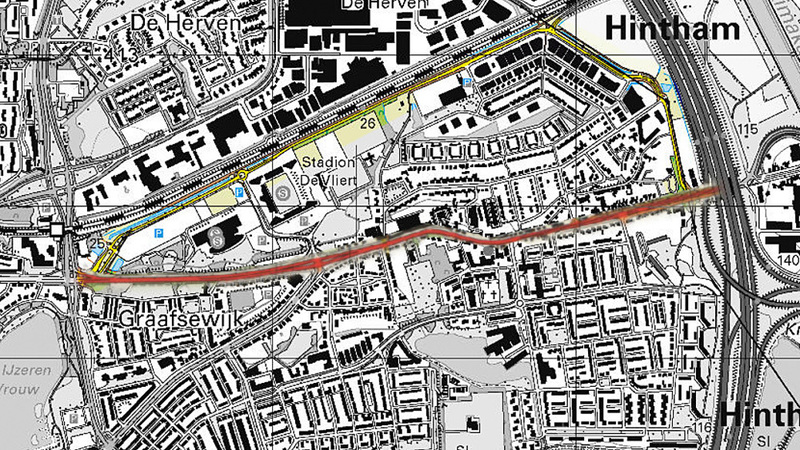 Now it is 2018, none of the subsequent councils of ’s-Hertogenbosch has wanted to remove the abandoned part of the 1946 road, even though it hasn’t been in use for 17 years. A most peculiar thing! Maybe we should make this road a monument for the time we led main car routes straight though residential areas. In a way it already is, unplanned, like everything around this road seems to be unplanned. Map showing the 1946 main route in red and the alternative 2001 route in yellow. (Maps from the website TopoTijdreis.nl). 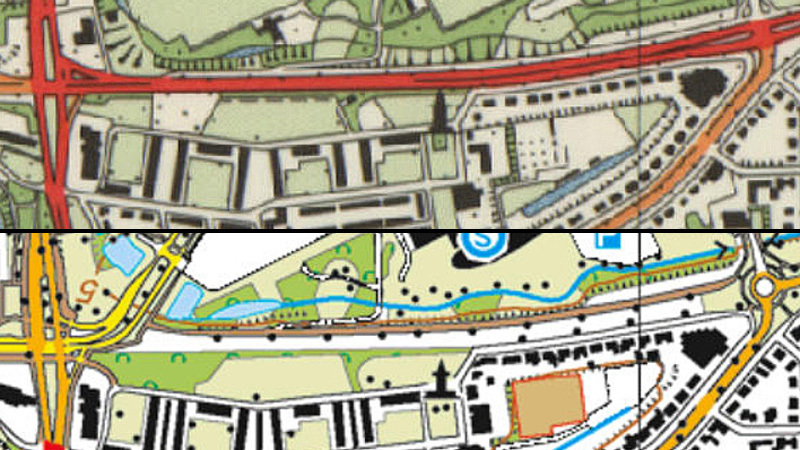 Comparing a 1995 map with a 2015 map. The former main road is now just a blank space. 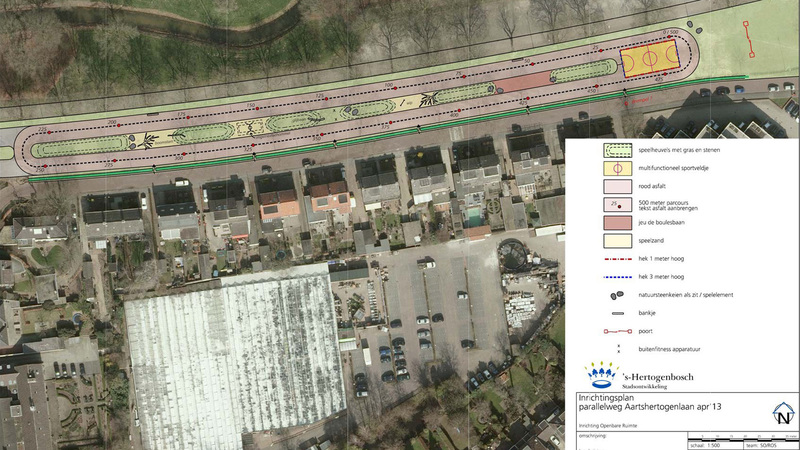 It is clear the cycle route (in orange on the bottom map) remained. Map details from the website TopoTijdreis.nl. Children cycling home from school, on the upgraded cycle route next to the abandoned former main road. 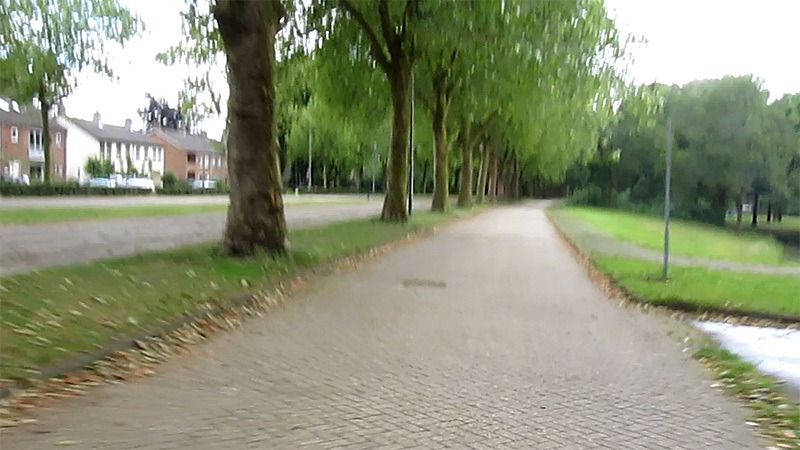 My video about the peculiar abandoned road in ’s-Hertogenbosch. * A previous version said 2011, because the source of this information is this website that mentioned no year and I found out 2011 had a Monday 3rd October (mentioned as day the works would start). However, as it turns out 2016 also has a Monday 3rd of October. This tweet of Hackney Cyclist shows the brick was still there in the summer of 2016, so it must be October 2016 and not 2011. A fascinating, thought-provoking post. Personally I love visiting old roads and infrastructure (nerd I am!) 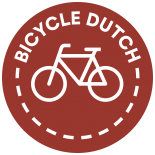 so this would be on my wishlist for a future visit to the NL. LOL that some residents moved away because of the new silence. Probably found it weird like I initially found the NL on my visit in 2013. 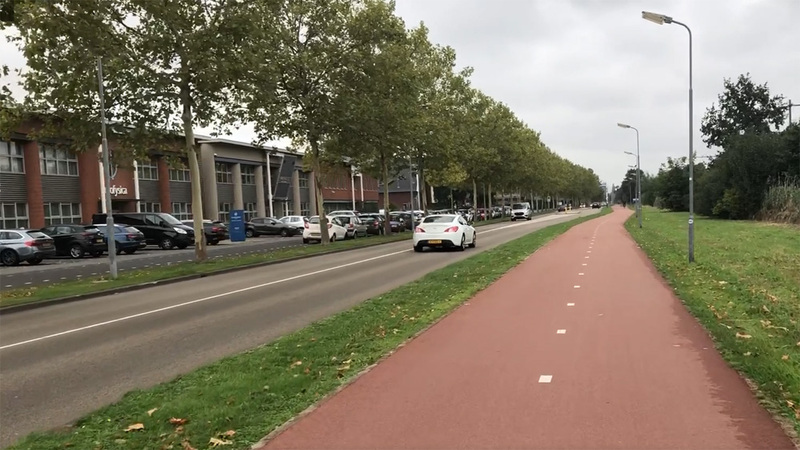 Perhaps the road in question is one of the many “grey” roads that Dutch authorities are still dealing with because they don’t fit neatly into either the Access or Distributor classifications? A through road goes from A to B, passing C. A through-road in C might have people on it with neither their destination nor origin in C.
A distributor road goes from a through road in C to access roads in C. People on it will have either their destination or origin in C.
An access road doesn’t go anywhere. It provides access to a limited number of properties in C. People on it are close to their origin or destination. Hi Jan, that’s how I understand it too, I couldn’t have said it better myself. So instead of this road having motor traffic with no business in the area at all, so vehicles that were just passing through, the current main street in Hintham is supposed to only have traffic with an origin or a destination in that former village. I am sure that is not 100% true (you can still go through if you really want to), but it will be for the major part. Here in the UK I’m sure the space would be filled with new houses. The US solution might be to seek a “free enterprise” answer. Companies could be offered the land (or use of the land) for free if they would provide suitable improvement of the area. Proposals would have to consider that it needs to remain a quiet neighborhood. I wonder what creative ideas might materialize. 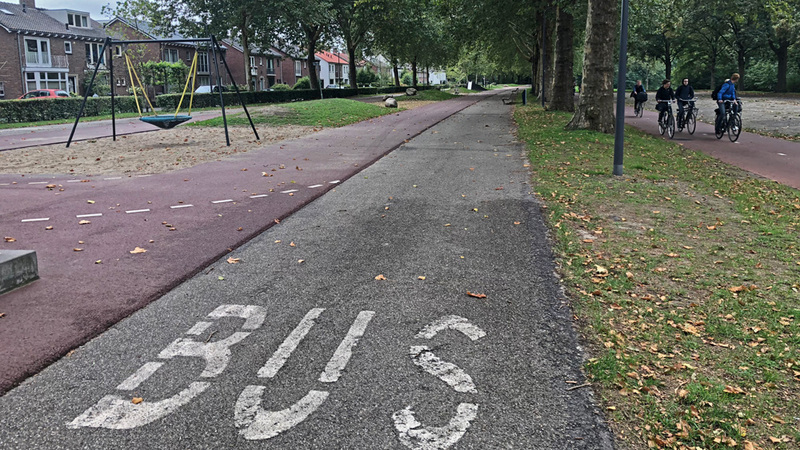 This entry was posted on 2 October 2018 by Bicycle Dutch in Original posts and tagged ’s-Hertogenbosch (Den Bosch), NL is not perfect, urban planning.